Photo of Mustafa Tamimi, a villager from Nabi Saleh who was killed by Israeli occupation forces with a tear gas canister fired at his face from point-blank range. Thank God it’s Friday probably had the most successful film debut in the village of Nabi Saleh, which premiered on February 2. The village’s cultural center was filled beyond capacity, and seats were hard to find amid an excited, cheering crowd. The documentary has been in the works for two years and focuses on the ongoing struggle to reclaim the land of Nabi Saleh, much of which was stolen by the neighboring settlement of Halamish. It features interviews and footage of Nabi Saleh residents as well as the settlers living in Halamish. Belgian filmmakers Jan Beddegenoodts and Niel Iwens collaborated on the project. Beddegenoodts said he was inspired to make the film after attending a demonstration in Nabi Saleh. 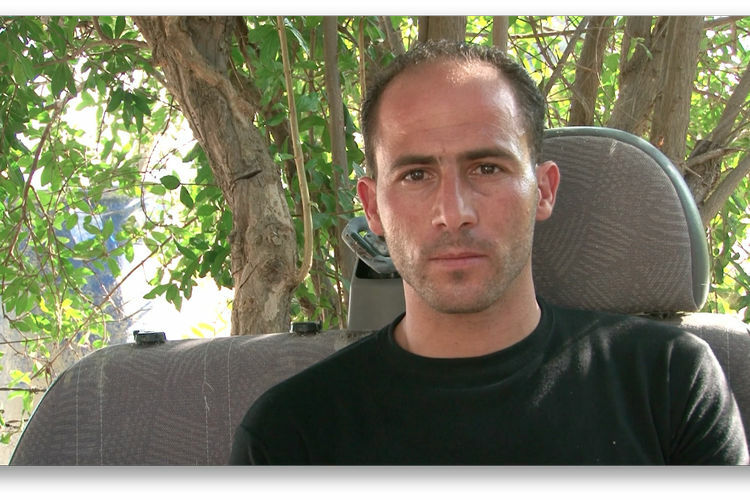 “The first time I was in Nabi Saleh, in April 2011, the protests were really violent. It blew my mind,” he said. The film’s title is a reference to the fact that demonstrations take place in Nabi Saleh every Friday. The demonstrations are marked by intense repression from Israeli security forces, who frequently use skunk water, tear gas, rubber bullets, and even live fire. During the production of Thank God it’s Friday, Nabi Saleh resident Mustafa Tamimi was killed by Israeli occupation forces with a tear gas canister fired at his face from point-blank range. Almost a year later, another villager Rushdi Tamimi was killed by Israeli soldiers’ live fire. The film features interviews with Mustafa’s family after his death. “It was really hard seeing his mother witnessing how he got killed, and it was really hard to see how the settlers considered it an accident, when he literally got shot to death,” Iwens said. Including the settlers was an important part of the project for Iwens and Beddegenoodts because it visually demonstrates the difference between Nabi Saleh, a village suffering from occupation, and Halamish, a settlement bolstered with funding from the Israeli government. It’s clear, watching the film, that the settlers in Halamish are not particularly bothered by the damage done by their illegal occupation of Palestinian land. In one of the film’s most powerful segments, two teenagers in Halamish discuss spending Friday relaxing by the pool, while in the background soldiers can be seen storming up the hill towards Nabi Saleh. “While the people from Nabi Saleh were focusing on resisting the occupation, the people in Halamish got comfortable,” Beddegenoodts said. The filmmakers hope the film will draw international attention to the problems posed by settlements. Although they do not yet have a distributor, the documentarians are committed to showing their movie as widely as possible in order to show the world what is happening in Nabi Saleh. Beddegenoodts and Iwens also want to see justice for the death of Mustafa Tamimi, but they do not believe this is likely to happen under the Israeli regime. Although justice is unlikely to come from Israel, Beddegenoodts and Iwens believe in the power of the people of Nabi Saleh to achieve justice through their struggle.